You can sow Lawn UK lawn seed mixtures at any time from late March to mid-October providing that in periods of unusually dry weather the seedbed is kept constantly moist until the grass is about 6cm (2.5 inches) high. Always water with a fine spray; to great a force of water will displace the seeds. It is also worth noting, that there needs to be adequate warmth in the soil, 6-8 degrees Celsius is required for germination, and this is usually when the air temperature is above 10 degrees Celsius. If during periods of drought, and there is no hosepipe ban, you may decide to water the area. You must ensure the ground is thoroughly soaked and watering must be done on a regular basis until the grass has become established. Occasional light watering won’t be beneficial, this will do more harm than good. When is the best time to sow the seed? This depends on you. If you want to sow in the Spring, you can sow any time from late March onwards. However, if you are patient, there is much to recommend waiting until September before you sow. Firstly, any weed seeds lying on or near the surface of the seedbed will be given a chance to germinate and can be removed. Secondly, English summers may produce hot, dry spells and if your new lawn is sown in the spring, constant watering may well be necessary to get growth started and to avoid the tender young seedlings from being scorched and killed off. There are many points in favour of a September sowing. The ground is warm after the summer, there tends to be more moisture about, the seed will get off to a good start before the winter and weeds will be minimal. Then, during the late autumn, a good root system will develop, as opposed to top growth, and your lawn will be in first class order the next spring and summer, ready to withstand hot, dry spells. Weeds can be a problem with newly sown lawns. 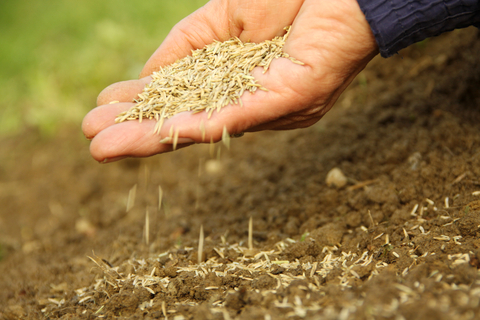 The seed used in our lawn seed mixtures is produced to very high purity standards but, no matter how good the seed or the preparation of the seedbed, some weeds will always appear because the seeds are already in the ‘seedbank’ in the soil. Lawn UK grass seed mixtures use only seeds that are certified. This means that you can be assured of the highest quality seeds that are free of problem weeds and have germination in excess of 85%. The likelihood of weeds in our grass seed mixtures is very remote. The best way to control any weeds that germinate from the ‘seedbank’ is to mow them out. Annuals are especially well controlled by frequent mowing once cutting starts. See also: How long to grass seed take to grow?